Pastoral Melodies. Australian Romantic & Classical Orchestra. City Recital Hall. March 25. Orchestral playing has been hugely refreshed in recent decades by a movement towards historically informed performance using old instruments or replicas and reconstructing what we can of earlier approaches to bowing, blowing and beating. Nicole van Bruggen played with charming woody individuality. Paradoxically, the historical approach was to varying degrees foreign to the 18th and 19th century musical mind. Mozart, Mendelssohn, Brahms and, if we believe the claims of his pupil Czerny, Beethoven all adapted earlier music to suit their own times when they performed it (Brahms being the most historically engaged). That in no way lessens the interest of groups like the Australian Romantic & Classical Orchestra (affectionately known as ARCO, which also means "with the bow"). But it does remind us that historicism has its own history. Conductor Richard Gill and ARCO, led by Rachael Beesley, took Mendelssohn's Hebrides Overture Opus 26, Fingal's Cave, at a reserved pace, drawing out its brooding mystery while retaining balanced clarity and some delightful fleeting tonal cameos from the wind. They used a seating pattern preferred by Mendelssohn, which reverses the place of the first and second violins with the wind lined up at the back, though from my side position it was difficult to judge the impact. Brahms' Five Songs, Opus 104, speak of a world of autumnal mellowness and solitude that the Sydney Chamber Choir drew out with balanced expressiveness. Mozart's so-called (some say wrongly called) Spaur Mass, KV. 258 (Piccolomini) manages to get through the longer sections of the Mass text, the Gloria and the Credo, with cheeky dispatch. The performance was perky, streaked with orchestral colour and mixed vocal solos. The major event of the afternoon was to rehear Beethoven's Symphony No. 6 in F, Opus 68 Pastoral enlivened with ARCO's feel for balance and the distinctive originality of some of its wind players. 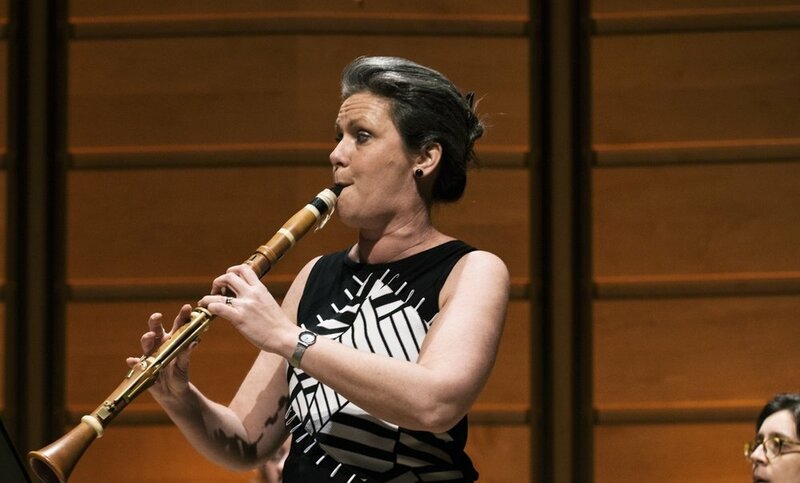 This went to more than the famous imitation of birdcalls at the close of the slow movement, in which flautist Kate Clark, oboist Eduard Wesly, and clarinettist Nicole van Bruggen played with charming woody individuality. The horn playing (Anneke Scott) brought warmth to the finale while the strings maintained tonal finish while still rising to the necessary intensity for the revelatory sunny radiance of the coda.